Not everything useful on the web needs a login or a software download. Some services can be a bit more flexible, and a bit less permanent. In this article I’m going to take a look at a host of such services, with I’ll refer to as “disposable services”. A disposable service, in the context of this article, is one you can use for free with no account or registration. It’s usually a matter of simply opening the website in question and getting to work. A unique URL is often created, which you can then share with others for collaboration functionality. 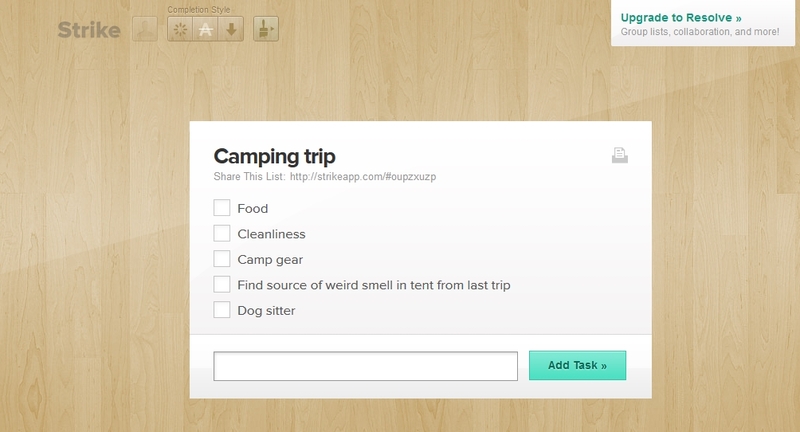 Here I’m going to list 10 such services that might help you collaborate on the fly or be more productive. In any case, you should bookmark them for future use! Strike is a to-do list project by the good folks over at ZURB. Share the list with anybody and work on it together! The interface is fast and clean and when you’re done you can print it all out. 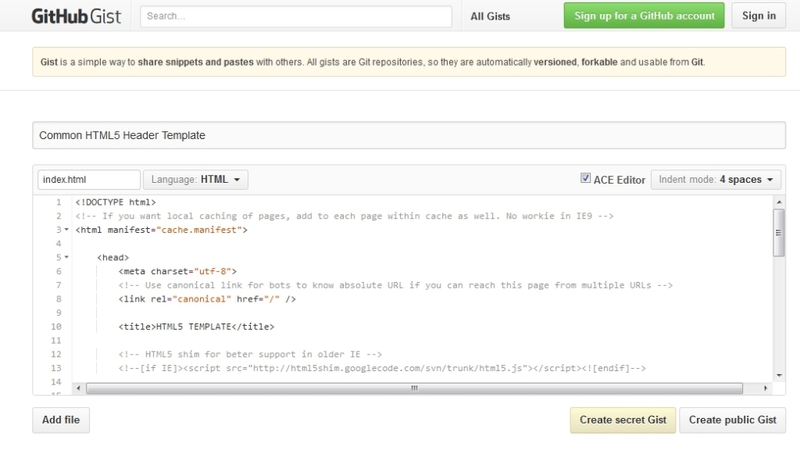 GitHub Gist is a code sharing tool that lets you paste code from any number of languages. The code can be used by anybody and forked or downloaded. If you are a programmer and feel like sharing amazing code snippets, this is for you. Whether you even care at all about sharing your snippets, it’s still a free and easy-to-use method of storing reusable code snippets for yourself or your team. If you’re logged in to Github, the Gist will be associated with your account and will be fully versioned. If you create a Gist anonymously, you won’t be able to come back and edit or delete it later. Gists can be set as public or private, with private only being accessible by knowing the URL. Everybody knows about Pastebin; the cool, free, text sharing utility that reveals government secrets and shady business practices everywhere. If you have something to say anonymously to the world, it goes on Pastebin. You can select code highlighting and pick the language if desired. You can have it listed publicly or leave it unlisted. You can also set an expiration on your paste so it will expire and be deleted automatically. Pastebin is not the only game in town, there are many of these types of services such as Tinypaste which allows password protection on your paste, and if you register they even do profit sharing on ads. Try Hastebin which has a super clean interface and supports auto syntax highlighting and more. Just like Github Gists, you gain some additional features and associations with your text if you have an account. Similar to Pastebin or Hastebin, Collabedit is a text sharing tool with an added benefit: collaboration with others. Just click “new document” and put in your name, you will have a URL to share with others. Anybody who “joins” your document will be listed, and you can work on the text together as well as chat. Another good tool in this category is Stypi. As soon as you open the link, a new document will auto-generate for you and be ready to share and collaborate on. If you are the developer type, you can install Firepad as a collaboration editor in to your own projects. The popular Nitrous.io uses Firepad for its editor, as does Socrates.io which allows collaboration on Markdown documents. Collabedit creates a pretty small URL, easy to verbalize to someone or send in a text. You might like the interface of Stypi better though. The free GoToMeeting app lets you set up a quick audio/visual meeting for up to 3 people. Share your screen, microphone, and webcam, with chat abilities. If you and your collaborators happen to have Google accounts (who doesn’t? ), then of course Google+ Hangouts is a very popular meeting tool you can use with relative ease when you are all signed in. An alternative to GotToMeeting service called vline which provides yet another free, online, instant video chat service using the WebRTC technology. 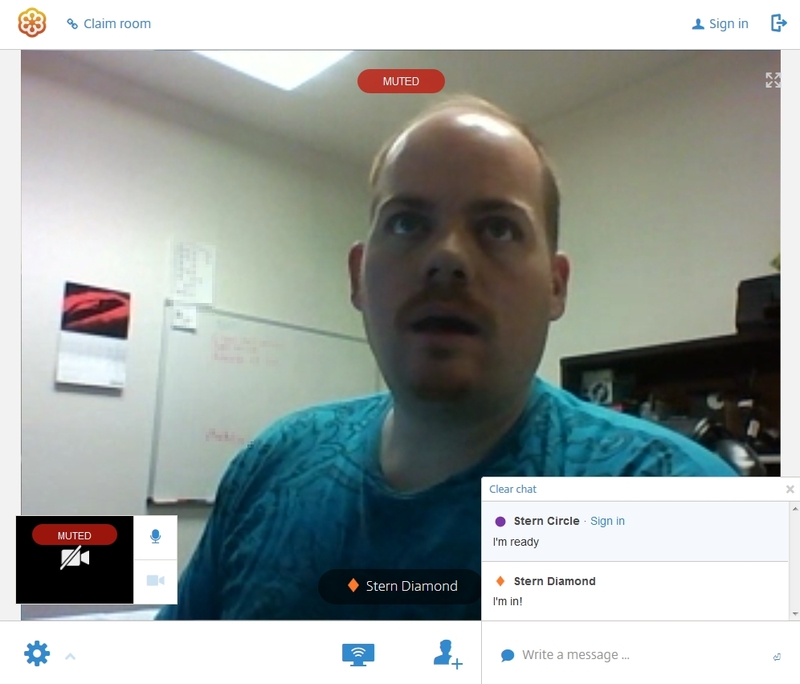 Our last mention here goes to appear.in, supporting video, audio, chat, and up to eight people per room, also using WebRTC. We’ve already seen collaboration based on video, code editing, or scree sharing, etc. Tlk.io is purely for text chat and does it very well. Create a room instantly by custom URL name (assuming it’s not taken and you join someone else’s room!) If you sign in with Twitter, you can have admin abilities over your room. One of the coolest features is you can get embed code to place a chat box directly into your own website! It supports @+username mentions as well as #hashtags which link to other channels. Images can be pasted inline via URLs, and links become auto-clickable. Basic Markdown syntax is supported. You’ll often see a “fiddle” pasted on Sitepoint for code examples, as well as all over the Stack Exchange network and anywhere people need to debug code or show how something works or doesn’t work. 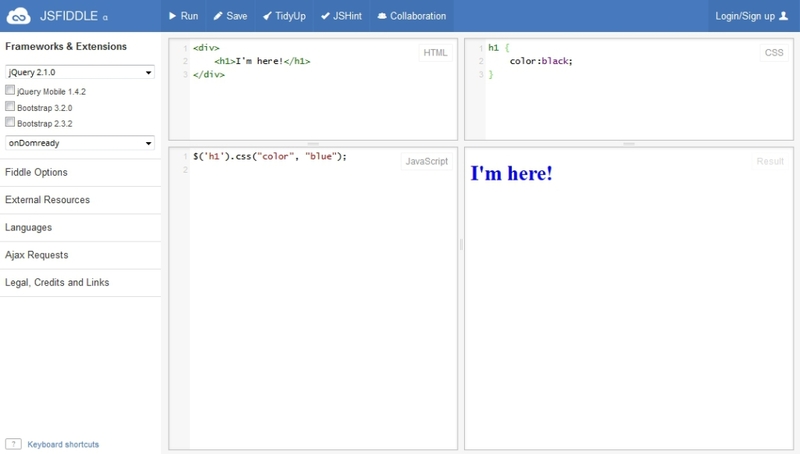 You can visit JSFiddle and instantly begin coding using built in frameworks and extensions like jQuery, Bootstrap, Mootools, YUI and more. 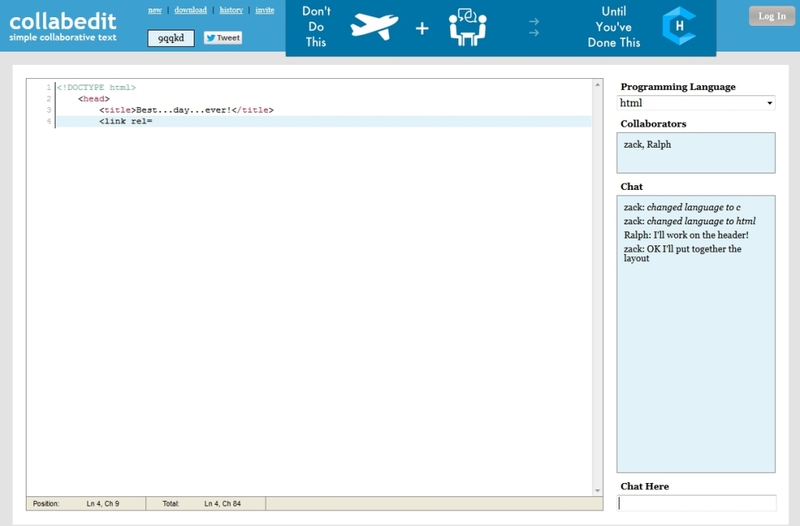 When ready, you can select to collaborate and invite others to code with you. A kissing cousin of JSFiddle is Codepen.io. It has many of the same features including Sass and Less support, but you have to add external libraries like jQuery via URLs rather than simple checkboxes. Codepen updates the live preview as you type, but JSFiddle requires you to click the “Run” button when ready to test. One handy service if you just want HTML/CSS is CSSDESK. You can share the project, but it is not collaborative in nature. Sometimes you just need to give people a link to a file! 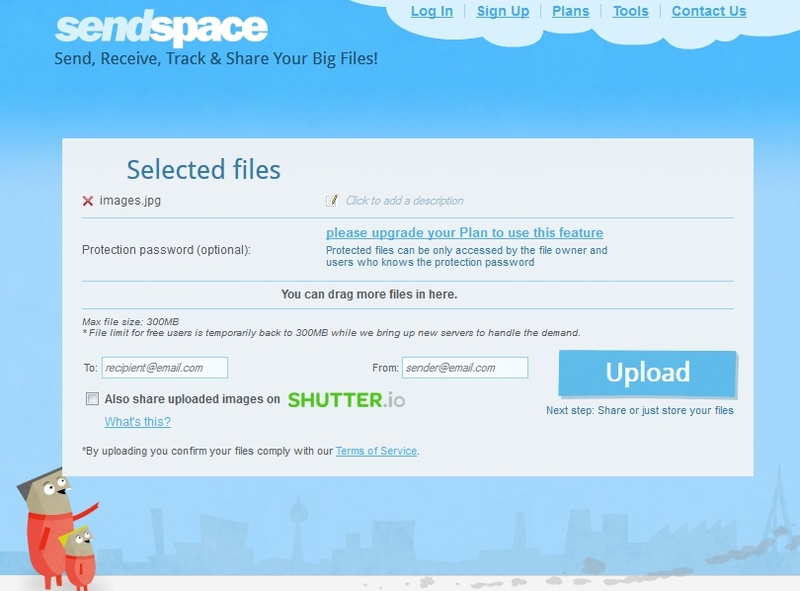 Sendspace let’s you upload any file and get a link for anybody to download it. The experience is unobtrusive and easy. You can even have it emailed to a person as soon as it’s uploaded. Another contender that I use is Speedyshare. It has a much simpler interface and is pretty quick to use. Naturally, if you have Google or Microsoft accounts, or really any file storage service, you can probably already share a file if needed. However, these services allow more anonymity and you don’t have to worry about keeping random files in your personal file storage accounts. If you want to make sure your files don’t last long, try using ExpireBox, they will hang on for 2 days and then the files are toast. Pixlr is one of the few advanced online image editing apps worth using. 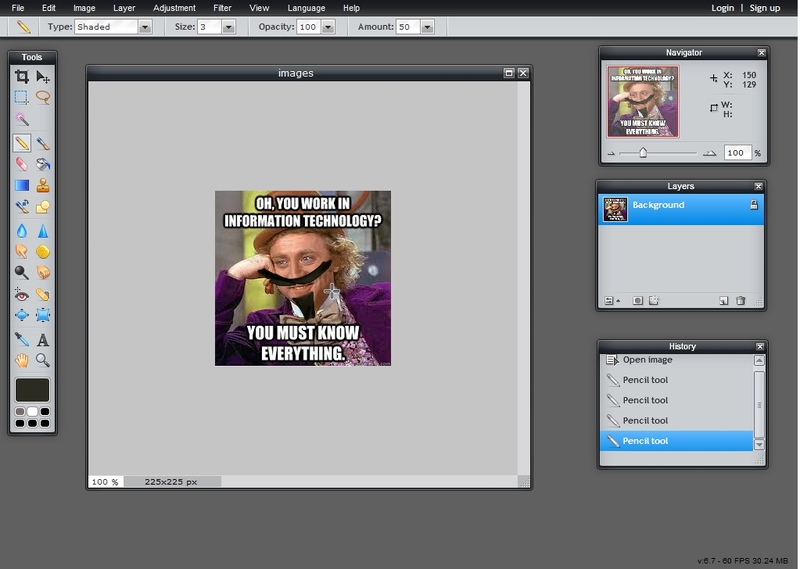 It supports layers, masks, layer styles, and nearly all basic utilities and edits you could ever need. Export your image in the usual formats: JPG, PNG, BMP, TIFF, and even a custom format for reuse in Pixlr (PXD). 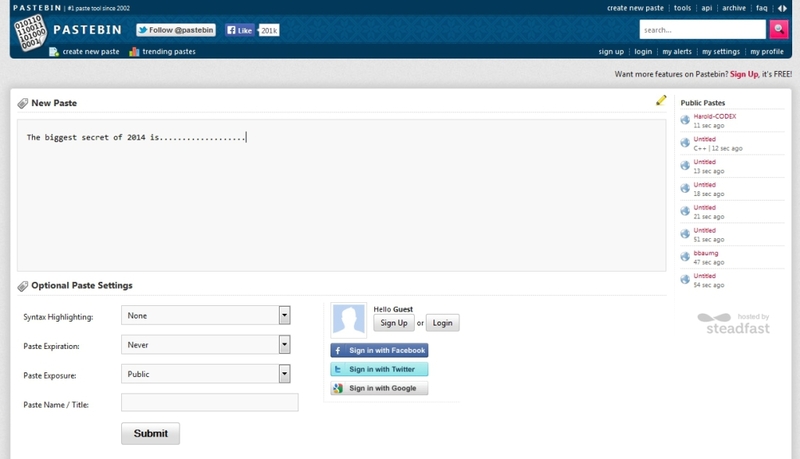 You can also export to Facebook, Picasa, Flickr, or a Pixlr library if you sign up. For a slightly more basic editing experience, try picmonkey. There are many one-click effects that you can add and then adjust, without having to worry about layers and masks and other advanced features. If you just want to crop, adjust exposure and contrast etc, try Picmonkey first. My last category is for collaboration whiteboards. Personally I find these more fun than anything but for you it might come in more handy. Awwapp has a simple, clean interface with only a few tools and exports to PNG. 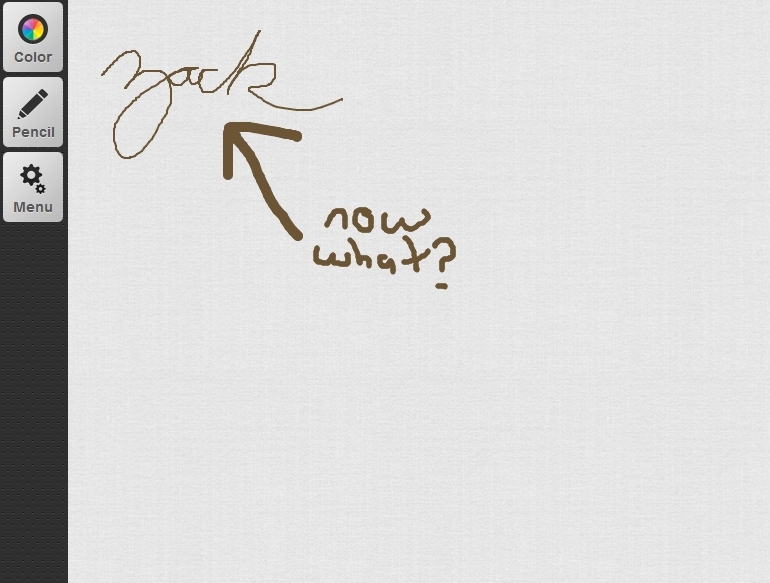 It supports mobiles and touch screens so it could be a way to create signatures or whatever you like. Try Webwhiteboard if you need a few extra editing features and tools. For the most advanced option, you must give Twiddla a try. This app features not just a whiteboard, but drawing on a snapshot of a webpage, or editing documents, or images, and more. You can embed HTML snippets as a “widget”, and even use mathematical formulas. I find the option of marking up a webpage to be a pretty cool feature. Plus you can chat with other people in the room, and it even supports audio. These are just cool tools, feel free to comment with your own! JSON parser – Paste in a JSON string and see the contents parsed in a more readable form. Regexr – Get help building regular expression strings. Code Beautify – Grab a chunk of code, paste it in here and let it beautify! Many supported languages. Placekitten – Use a simple URL to automatically load an image as a placeholder for your projects. This one uses kittens, and we all love kittens. Two more are placehold.it which uses simple grey boxes for the images, and lorempixel which lets you base the random images on categories. This list is nowhere near exhaustive, nor does it cover any particular industry. You can find sites for sharing photos, audio, providing data, and a million more. Do you have any more disposable online tools you can’t live without? How about data management tools, event listings, text parsing, audio, content analysis. Share them below! Shameless self promotion, but check out http://convertcase.net/, quite handy when clients send you emails or documents typed all in UPPERCASE! An article like this could go on forever. People should comment with their favorites! Another for the list (and shamelessly shared): CV-LO, a simple client-side service for creating resumes from Trello. It's open source and lives on Github.